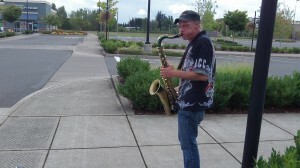 Here’s a look at the saxophone player I mentioned a couple of weeks ago. He had been entertaining passersby off and on at the North Albany Village shopping center, and at the time, when I wanted to get his picture I could not find him. Somebody had complained about him on Facebook, but I liked his music and I hoped he had not been run off. On Saturday (Sept. 21) he was back. He told me his name, Ed Raines, and said he had moved to the mid-valley two months ago from Iowa. And no, nobody had told him to get lost; he plays at a number of different places. He also said he’d be taking part in a blues jam at the Calapooia Brewery on Sunday.